If you live in Malibu and watch the news, you undoubtedly keep hearing about the drought in Los Angeles. As we don’t get a lot of rainfall, our water reserves are becoming more and more scarce. Obviously, the less water we will have, the more we will be forced to pay for it on our utility bills. Therefore, your Malibu remodeling firm, Busch Design Build, Inc. will provide three tips for optimal water conservation to help you be more eco-friendly. 1. Upgrade to Water Conserving Features – We’ve mentioned the importance of using appliances that save water in other blogs, such as Malibu Green Remodeling Ideas, and this is really the most important change you need to make for optimal water conservation. Between washing your bodies, your faces, your clothes, and your dishes, tons of water get wasted every single days. Purchasing new appliances and water features as part of your Malibu remodeling will provide a modern new look in your home, but also will help you minimize your carbon imprint by saving water. For example, ENERGY STAR certified high efficiency electric storage water heaters will save about $250 a year for an average family, claims the site. ENERGY STAR washers will use 35% less water than traditional, and a certified dishwasher will save about 1,300 gallons of water over its lifetime. 2. Fix Leaks – When you are undergoing a Malibu remodeling project, you will concentrate on the big stuff, but don’t forget the little stuff, either. Have you top-rated Malibu contractor check your house for any possible water leaks. Water leaks can come from anywhere, pipes, toilets, dishwashers, water heaters, etc. The US Geological Survey Water Science School claims that if a single faucet in your home leaks five times a minute, that amounts to over 7,000 drips a day, and a whole liter of water wasted. Your contractor can easy check for leaks, and fix them for a minimal fee. 3. Change you Landscape – When considering a Malibu remodeling project, don’t just focus on the inside, but on the outside too. Did you realize how much water you are using to water your lawn? “The average American household uses 320 gallons of water per day, about 30 percent of which is devoted to outdoor uses,” according to Water Sense. “More than half of that outdoor water is used for watering lawns and gardens.” There are two ways to save water outside. The first is choose plants native to your area. 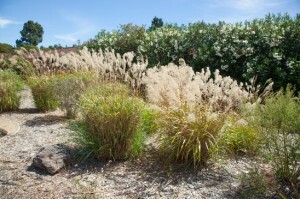 In our blog, Malibu Native Plant Design, we listed greenery that is native to Los Angeles. Those plants are used to our hot and dry climate, and will not need as much water as other ones. If you are set on having a grassy lawn, however, you may still save water. First of all, when it’s not very hot, water your lawn every other day, instead of every day. Water Sense provides this tip to see if your grass needs water: “Instead, test your lawn by stepping on a patch of grass; if it springs back, it doesn’t need water.” Also, remember to water early in the morning so water has less chance to evaporate with the warmer daytime air.